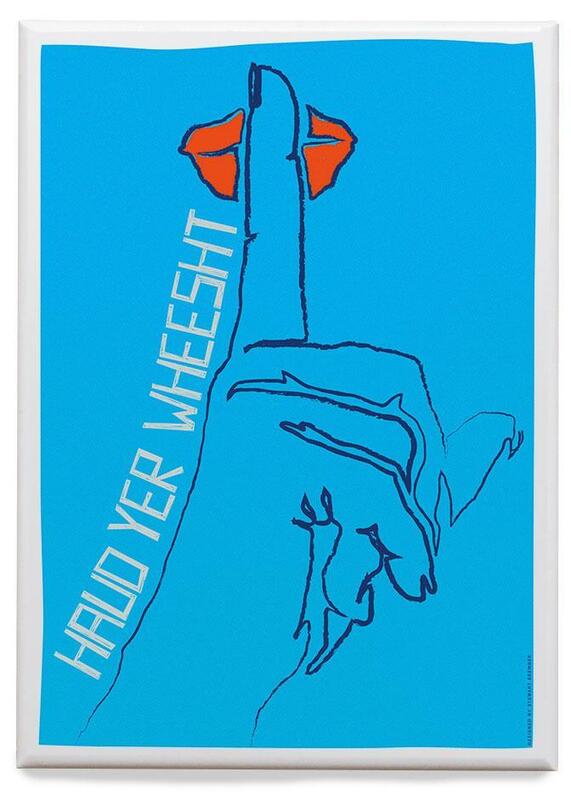 Home > Scots > Haud Yer Wheesht? Ivery weekend, ye’ll find me at mercats in Embra, sellin ma airt. Whilst it’s hoo ah earn a livin, ah didnae choose tae mak airt celebratin Scotland’s culture, language an history as a money makker. A chose tae dae it acause ah ken those are things maist o us were nivir taucht, dinnae ken ower much aboot an, aw tae often, dinnae even ken exist for the maist pairt. Noo uisually a jist talk aboot those things at the mercats, wi customers fae both near an far. But in the past few weeks, a few things happint that got me tae thinkin mair. It stairtit efter seein the braw Rip It Up exhibition at the National Museum o Scotland. Noo, ah’m a big music fan an a ken a fair bit aboot oor post-war musical history. Still an on, seein it as a single event wis great an even caused me to challenge some ideas ah’ve lang syne learnt: those bein that Scottish pop music of the ‘80s – Big Country, Simple Minds, Hue & Cry an siclike – was pure pish. Turns oot that a unco much of it wisnae an ah’ve spent a guid lot o time in the past weeks learnin mair. Mind, whit really struck me fu square efter leavin the exhibition wis jist hoo muckle oor contribution tae pop music haes been, whan ye consider Scotland’s size. Ye micht mak the comparison tae Scotland’s impressive history o inventions. Whilst maist o us ken aboot Logie Baird inventin the telly, or Watt’s steam ingine, gowf, the telephone, Adam’s economics an aw that, can the same be said for oor knowledge o oor culture? Ah’d say mibbes naw. See, ootside the exhibition, a vox-pops video shawed fowk’s reactions. Yin o thaim said they had nae idea so many o those bands were fae Scotland. Ah think that’s baith sad an tellin. We dinnae ken oor ain culture. We dinnae value it an certainly we dinnae celebrate it. Ye micht think ah’m bein ower-dramatic but consider this: at yin o the mercats the weekend jist gone, ah owerheard a body callin ma drawins ‘tourist tat’. Ye’d be richt in thinkin that ah wis no best pleased, but ah’m no daft enough tae take it tae hert. Ah ken they’re no tat. Yet mind the idea, tho. Ye’ve probably said somethin like it yersel, aboot shortbread tins or the like. ‘Tartan tat.’ Ah ken ah’ve said the like masel. Hae ye ever considert whit that’s aboot? D’ye think tartan an shortbread, as the maist-cited examples, are really things tae be sae affrontit by? When ye think aboot it, hoo many kintras hae such instantly-recognisable artefacts? It’s awmaist like we’ve been taucht tae no value oor culture. Ah’m mindit o the first time a heard Billy Kay speakin Scots a few years back. It gied me a richt beemer. Pretty much the same thing happent when ah wis a kid an heard The Proclaimer’s singin wi Scots accents. It soondit wrang. They warna proper words. Ye warna meant tae speak like that. There cannae be mony countries whae feel shame aboot their ain culture. There cannae there be mony whae deny their ain language is a language. Imagine if we aw kent tae caw it a leid, no a language. Last week a stairtit watchin the telly programme Outlander. An there it wis. Awbody speakin wi Scots accents. Uisin Scots words. Aye, they were speakin Scots dialect o English, but still. That’s the leid maist o us uise, efter aw, an they warna dumbin it doon. It wis awmaist a miracle tae hear. Owerwhelmin. Shockin in its ordinariness. Jist a wee aside here: a freend whae haes jist startit watchin Outlander an aw, learnt there aboot the bannin o kilts that happint efter the ’45 uprisin. Aye, it’s no jist oor culture an leid we’re no taucht. In the past few days, there’s been a couple o bonnie Scots leid articles in Bella Caledonia. Sara Clark shines a licht on oor self-hatred in usin Scots with the clarity o yin whae wisnae brocht up in Scotland an Paul Malgrati teaches a vailuable lesson in acceptin whitever grasp o the leid ye hae. Ah’m awfy pleased tae see this crack growin but, mair than that, efter readin the pieces, ma heid wis like a struck bell, wi the shapes and soonds o the words ringin roond an aroond in it. Ah could feel them in a wey ah’ve never felt English. They felt awmaist like they were in ma bones. Aye, ye could mibbe acuse me o romanticisin the situation but a ken whit a felt. Mibbe you’ve felt it tae. Yince ye’ve leukt, it’s ower hard for maist tae deny that Scotland haes its ain culture and leids. Yet plenty dae. In mony weys, ah cannae blame them. We’re aw products o oor environments an, for centuries, maist o us were taucht that we had nae culture an nae leid. It’s bin drumt intae us since we were bairns. Tae change is nae sma thing. Tae owerturn centuries of denial is even less sma. So lets mak it easy on oorsels. Let’s dae this yin stap at a time. For me, aside fae ma weekend mercat preachin, ah’m tryin tae stairt tae uise mair Scots words. It’s no awfy comfortable tho. Ah feel like a fake, like am tryin tae soond less intelligent (because educatit fowks dinnae uise the Scots). Ah hate that feelin, o the strangehold the wrangs ah wis taucht still carry. Unlearnin those wrangs taks time an effort – but ah am gaun tae try. Richt noo, ma Scots is like a thin tattie broth whit haes aw dried up. There’s some richt tasty dauds but naething tae jine them. Tae sae the least, ah’m no muckle confident. Aye an on, if ah kin come tae like ‘Labour of Love’ – then a kin learn tae be brave aboot uisin Scots. An am gaun tae read mair aboot oor culture an history too. Gaun tae jyne me? Guid man! Yaise Scots. If it isnae oors tae speak, wha’s is it? Weel duin Stewart. Anither thing ye’ll finnd is that speakin Scots in new airts will also tak a muckle wecht aff yer shouther. It’s liberatin! Ye’re either pairt o the solution or ye bide pairt o the problem. Walcum tae the solution. Beautiful, Stewart. As an auld Aiberdeen loon, fae Torry, fa’ left Aiberdeen 50 year ago,, when I visit, fowk dinna ken I’ve bin awa as I still spik the same as I did. In fact, ah’ve bin telt that some words I use hiv bin either smoothed ower or ‘Englified’ or even nae langer used! Result o’ the oil industry bringin’ in a’ the ‘furriners’ a’ guess. Fit gets ma’ goat is the fact ‘it some o’ them jist accept it! Fit happened tae them? We used are be proud o’ oor dialect in my day. (Excuse Scots spelling, not used to writing it but will try harder next time. Great article, thanks. I enjoyed The Rise of the Clans on (ahem) BBC last night. Not just for the great story well told (aye, by Neil Oliver! ), but mostly it was full of Scots – and Gaelic – being spoken, like it was, y’know, normal. Well said. A hiv tae talk it tae masel doon here in Australia. When a dae talk it or play with its beauty and strength am back we ma mammy and ma granny again. It’s no pure or restricted but liberating and invigorating. So keep at it. If you want maximum impact amongst the young, you could do worse that a Scots-speaking commentary of a games-playing Youtuber. There’s always a demand for niche, like Skyrim-playing 82-year-old granny Shirley Curry (I found today; she has over 440,000 subscribers). The advantage of such stream-of-consciousness commentary, if you can manage it, is that with concentration on the game, the language should be less false or forced, in theory anyway. God knows why these things are so popular, but there you are.